The purpose of this post is to help you understand the fundamentals of SAS programming environment and language. It is intended to give first time users an idea about the SAS software and how to access it and get you up and ready with SAS programming. At the end of this tutorial, you would be acquainted with SAS basic syntax rules, how to enter data into SAS, variable types and how to run a program in SAS. If you really want to make your career in analytics, you should focus on learning SAS programming as SAS is a world leader in softwares for advanced analytics. To see the real potential of SAS programming, login to any job portal and search for jobs required skill set of SAS. You would find a large number of jobs waiting for you if you know SAS. SAS stands for Statistical Analysis System. You can explore and manipulate data in SAS. It can analyze your data statistically and mathematically. Includes various statistical techniques. It can generate beautiful graphs and tables. You can run SQL queries on SAS datasets. You can automate repetitive tasks with SAS Macros. It can develop entirely new software applications. Check out this link - Free download and install SAS software. 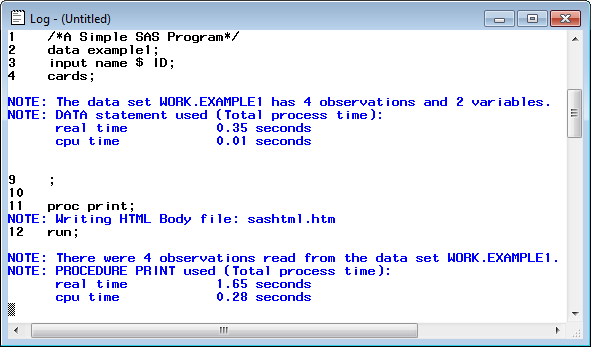 Output Window: where the result of SAS programs are printed. There is one more window linked to this window - Result Window. In result window, you can see each section of your output. To submit the program, press F3 or F8 shortcut key. Alternatively, you can click on click on the icon of “the little guy running” at the top of the SAS tool bar. It is where error messages and executed SAS commands are printed. Where SAS data sets are stored? SAS files are stored in a SAS library. A SAS library is simply a collection of SAS files (data sets) that are stored in a folder. SAS files are stored either temporarily or permanently. By default, it is stored in a temporary library called Work. 1. Temporary : When you don't specify a library name at all, then the file is stored in a temporary SAS library called Work. When you close out the SAS session in which you created the SAS file, the temporary library and all of its files are removed from your computer's memory. In this case, example is a data set that is stored in work library. Note : You can specify the library name Work followed by dot (.) and then data set name. 2. Permanent : If you use a library name other than the default library name 'Work' when creating a SAS file, then the file is stored permanently until you delete it. That is, you can use permanent SAS libraries and their contents in subsequent SAS sessions. You can specify the library name followed by dot (.) sign and then data set name. In this case, example1 is a data set that is stored in mydata library. All SAS statements (except those containing data) must end with a semicolon (;). 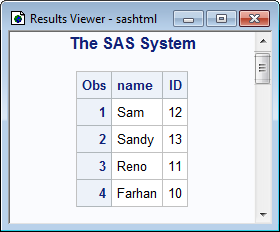 Example : "DATA example1;" is an example of a SAS statement. Any number of SAS statements can appear on a single line provided they are separated by a semicolon. Example : "DATA example1; Input Name $ ID;" is an example of a SAS statement. SAS statements are not case sensitive, that is, they can be entered in lowercase, uppercase, or a mixture of the two. A delimited comment begins with a forward slash-asterisk (/*) and ends with an asterisk-forward slash (*/). All text within the delimiters is ignored by SAS. All names must contain between 1 and 32 characters. The first character appearing in a name must be a letter (A, B, ...Z, a, b, ... z) or an underscore (_). Subsequent characters must be letters, numbers, or underscores. That is, no other characters, such as $, %, or & are permitted. Blanks also cannot appear in SAS names. If the variable in the INPUT statement is followed by a dollar sign ($), SAS assumes this is a character variable. Otherwise, the variable is considered as a numeric variable. Any portion of a SAS program that begins with a DATA statement and ends with a RUN statement is called a DATA Step. DATA steps are used to manage data. In detail, DATA steps are used to read raw or external data into a SAS data set, to modify data values, and to subset or merge data sets. 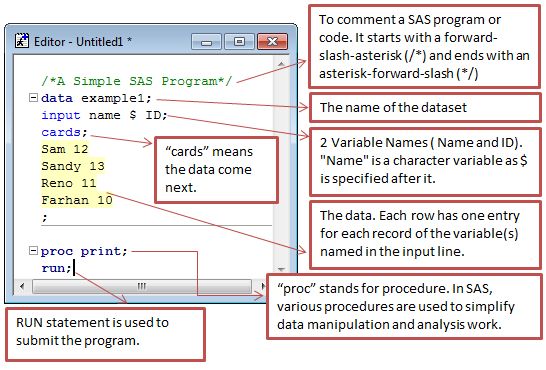 Any portion of a SAS program that begins with a PROC statement and ends with a RUN statement is called a PROC Step or Procedures. PROC steps are in-built programs that allow us to analyze the data contained in a SAS data set. PROC steps are used to calculate descriptive statistics, to generate summary reports, and to create summary graphs and charts. The above program creates a dataset named 'temp' which is stored in WORK library. In the dataset, there are 2 variables/columns - NAME and ID which contains 4 observations/rows. The command 'PROC PRINT' tells SAS to print the dataset in Output Window. 32 Responses to "Getting Started with SAS"
It is great site for SAS Learners. Appreciate your great work. awesome site to learn sas, nd thanx a lot .. This is the wonderful job you're doing. Thanks. Awesome site to learn SAS and data analysis. Excellent work! Just started as a student (programmer) assistent, and is learning SAS. This site is helping alot! Great work..Really very useful for people who wants to start SAS from ground level.Everyone can easily understand the subject. excellent website to revisit the concepts for SAS and sql. Keep up the good work !!! no more words really very nice..why don't you take a classes? Thank you very much for taking time out of your busy schedule to give your feedback. Cheers! Hi, Deepanshu, thanks for the outstanding explanation. Iam a beginner in SAS CLINICAL. What's your suggestions for a beginner like me with out any prior programming language. Your kind suggestions will be appreciated. Thanks. Azhar. excellent website for beginners . Thank you so much for such an amazing content. Listendata is a great website and providing best SAS tutorials that are essentail for SAS beginners. These SAS tutorial are very helpfull and greate work from the admin. Thanks!